You have 100% control over where your life goes. Even though it may feel like life is something that is happening to you, your life is built on the beliefs you hold and the choices you make. The actions you take are a small pebble, thrown into a pond, that ripples out to be the lifestyle you are living. You are all living the lifestyle of our creation, right now, and you have the ability to create a new life. You have the ability to create and live out your own lifestyle design. You, can live the lifestyle that you design. So, how do you change your lifestyle? How do you design the life you want? What I’m giving you here is an exercise to tune into and leverage the power of Lifestyle Design. On my blog and on my YouTube channel I’ve given you all the nuts and bolts you need to be successful. How to build a funnel. How to communicate with email. But if you spend all your time learning only the logic work side of it, you’ll be missing a big part. You’ve got to get your subconscious mind working on your lifestyle design. According to Maxwell Maltz, the mind is like a thermostat on a wall. You set your thermostat to a certain temperature and when the room goes beyond that temperature it turns on to bring the room back to your preset design. This is what your subconscious mind does. You need to implant the idea and vision of your perfect dream life, your perfect dream day, in your subconscious mind so that it goes to work for you. This really works. It’s not something new agey or spiritual. It’s not some kind of hypothesis, it’s proven. It is the way our minds work. Okay, now it’s time to implant this perfect life in your subconscious mind! Go get a pen and a piece of paper. A REAL pen and REAL paper. No typing this one. Don’t use a pencil either, it’s better to not be able to erase what you are going to write. Next, write out in extreme detail what your perfect day looks like. I mean EXTREME detail. Write out every detail from when you wake up in the morning until you fall asleep at night. Keep your designed lifestyle within the parameters of your life. If you have kids, integrate them into your perfect day. If you have a partner, integrate your partner into your perfect day. This is your opportunity to truly design your life the way you want it! Write it out. Every detail. How do your surroundings look, feel, smell, sound? Be specific. This video explains the process if you would rather watch... But you can read it below! What does the bed feel like that you’re waking up in? How is the lighting? Natural light or blackout curtains? What does your house look like as you walk out in the morning? Open floor plan? What does the kitchen look like? Granite, quartz, or another kind of countertop? What is your morning routine? Do you workout? Do you meditate? Read or journal? Are you up an hour before your family? Do you drink coffee? Bulletproof? Aeropress? Tea? What kind? Are you at the dining room table? Or on the deck? Or the patio? What does it look like? What’s the view? Are you overlooking a beautiful valley with peace and quiet? Or are you walking to yoga from your condo downtown? Do you finish your morning ritual then get an hour of work done and then spend time with your kids? What does your work day look like? Are you working from your home office? Or from a coffee shop? What do you eat for lunch? Are you meeting friends or a new client? Are you eating at home? What does your afternoon look like? Do you go for a long walk? Take a nap? Do you live a block from the beach and walk there during the day? What do you have for dinner? Where? Who cooked it? Who are you with? What are you drinking with it? What does your evening look like? Do you sit and watch TV? Read a book by a fire? Meet friends for a drink? Close it up with going to bed that night. Nothing is off the table. This is your opportunity to truly design your life the way you want it! If you don’t know exactly how to write it out that’s fine, just keep the pen moving. Write. Write. Write. You don’t have to ever let anyone read it. I recommend you don’t have anyone read it because it’s really just for you. You can destroy the pages as soon as you’re finished, if you want. You can keep a separate journal and continue to do this practice daily, or monthly to see how it grows and evolves. This isn’t something you should do just once. And if you mess your day up, don’t give up! It’s not set in stone. The goal of the exercise is to tune into the intangible potential of your subconscious mind, which has the power to create your reality. You have to focus yourself on a target, but that target can always change. If you do it once and nail it, great! If you revisit it every week, great! Just like everything; it is important to get it going. Writing out your perfect day will subconsciously implant in you a guide to evaluate all decisions by, an extreme follow through that does not get deterred or knocked off track, and the initiative to start what it is that you truly want. It becomes your guiding light, your north star. It brings energy towards where you’re going. Write it all the way out. Spend some time. Take as much time as you need to dream. It’s important to dream! If you are wanting more examples of this process... Here is one from Frank Kern. This video below is from Frank's "Core Influence" talk which has become infamous in the internet marketing world. You will hear how Frank Kern was living a life he didn't love... He felt 'stuck' in Macon, Georgia and dreamt of a better life. He allowed himself to dream... Down to the minute details... And sure enough? It ended up coming true. Make it as long as you want. Make it as long as it needs to be to get in all the details of your perfect day. Here’s the thing, you are downloading this perfect dream life into your subconscious mind. It is absolutely a goal achieving mechanism! It’s always running in the background. Every night while you’re sleeping and every day, all day. Always crunching ideas and possibilities to align you with the goals of your life. Impressing on your subconscious mind the vision you want to create is how you actually create your new reality. This is how you design the life you want. This is how you design your lifestyle. Know this, your perfect day will change throughout the stages of your life. You’ll also find that your perfect day gets tweaked as your business and income grows. It will change as your family, relationships, and life circumstances change. It’s important to mention, this exercise is not to make you feel that you’re in a position of lack. Showing gratitude for what you have is really, really powerful. Establishing a practice of gratefulness, such as a gratitude journal, can be very helpful. This perfect day exercise is designed not to bring discontentment for where you are, but to bring excitement and passion for where you’re going. Of course, you have to do the work. But you also have to have the vision. 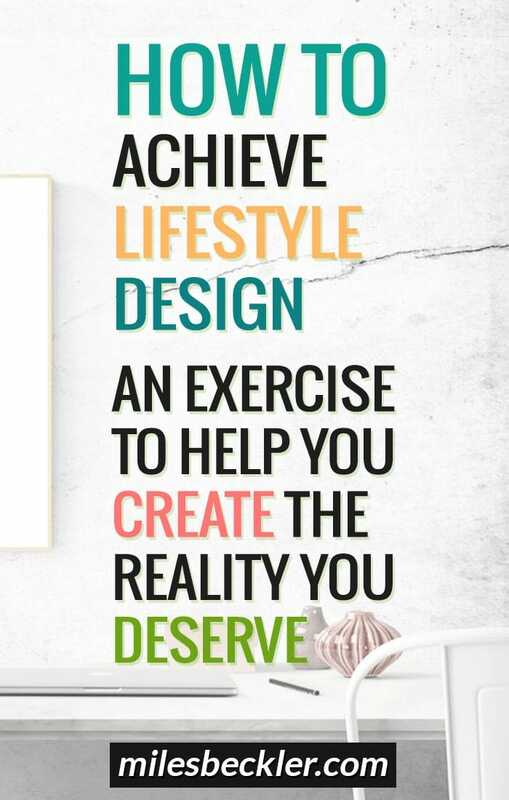 You have to create your lifestyle design otherwise someone else will create it for you. When your subconscious does the work of aligning your life with possibilities, then you will see the lifestyle you’ve designed become reality. This will give you a strong “why.” Your “why” is what gives you the strength and motivation when everything in you does not want to persevere. Watch Frank Kern’s core influence talk on Youtube. [INSERT YOUTUBE VIDEO] It’s a really cool talk. I’ve watched it time and time again. I hope you’ll take time to watch it for yourself. I want you to live the life of your dreams. I know, in order for you to get there, you have to get specific about what it looks and feels like for you. At first, it takes a lot of work for little reward. But then, there comes a tipping point. After that it becomes less work for greater reward. I’m living it. I’m sharing it. I’m doing everything I can to help you experience it too. Now get to work on your perfect day and your very own lifestyle design. Hello Miles. I was starting to make a Shopify Store, but watched you and Frank last night and I am not sure that's a good Idea now, especially since I don't have the Kind of Money that is now needed to advertise. Your Arbitrage sounds perfect, but I am 75 and I think I would have a hard Time convincing Prospects that I know how to build Websites (which I don't but I can learn). I need to find some way of making Income to pay my Bills and my Mortgage. Do you have any Suggestions? I would really appreciate it. Nice job! But, I'd like to share one additional thought: You say that this process is not spiritual. I believe that it is. In fact, for me it is more than a belief; it is a knowing. The Subconscious is really your connection to all that is; to the group consciousness. Some would use the term 'God' to describe this. It is a useful term as it is universally recognized, but as recognizable as it is, it also is an equally bad term, as this same universal recognition has many assigning it an erroneous and false set of ideals, purposes, and actions. Nonetheless, the art of creating ones best life is an act of working with that higher power, and for success requires that one tap into their inner, True Self - the God within. However, please know: this is not about religion. Religion long ago abdicated its sole responsibility of teaching about our higher power and spirituality. This is about Spirituality. The two have become, for the most part, mutually exclusive, rendering religion powerless. Love it, great clarification. My #1 goal is to not put off anyone so everyone can 'get it' but you see through my 'delicate balance' of word choices to the core of what is going on here... Cheers! Dude, that Frank Kern lecture was powerful. And what is so wonderful about that approach is that you won't be draining yourself but actually building up your power and strength because you are acting through sincerity. I think his lecture is hugely influencing how you are going about doing what you are doing. Nice. And I love how non-committal he is about the fact that this is a spiritual/Law of Attraction process, yet it worked for him... Lol. I've probably watched that video 5 times... Love it! Cheers, Tom! Thanks for the comment. Yes. That's because he had a rep probably as a bit of a bad boy and was making the transition to a more awake place. He was afraid they'd laugh him off the stage. Also, it really disarms people when you don't come in and preach like you have the ultimate solution, but instead you are vulnerable (though I think he was sincere in his trepidation). I haven't done the exercise yet, but am already feeling internal shifts. The key is to focus on the experience you want more than specific things. I'm actually going to have to write about this somewhere. What is fascinating is these experiences we want--status, power, abundance, community, connection, creativity, productivity, camaraderie, love, affection, time to rest, helping others--these are all experiences you could have had as some primitive being sitting around a fire or plowing the fields. They are elemental, and they don't require the bling to achieve (though nothing wrong with enjoying some bling). It is a subtle, but profound shift. I also love his part about if you live and communicate from your subconscious core you will attract like-minded people. As you know, I'm at the start of this entrepreneurial journey (but not the start of the FI journey); I really have to acknowledge that my subconscious has a lot of fear floating around in there for reasons I can't even fathom--fear that his only surfaced as I step towards entrepreneurship (zero fear in jobs, and little fear when investing). It's weird because in general I am a super confident dude; but there it is, lurking underneath. But it is coming up and out and getting addresses just by taking action every day. AKA growth. All great points, Tom... And realizing it is about the experiences not the things is HUGE! In the FIRE world there are so many people 'holding out' for their target number but if they were clear on what they wanted, maybe to travel the world or to still work a little in their community in a very different role, they could possibly retire immediately, but that focus on "Must have 2.5million in Vanguard" vs... I want to 'feel' like I have a 6 figure passive lifestyle that lets me live on the beaches of Thailand or Croatia can be a total block. Because that lifestyle they desire could be a $40k/yr lifestyle and drop their number to well below what they have... Lol. I just got wicked specific on a random idea there. Hahahah! Thanks for your comment Tom, Always appreciate connecting! One last comment. FIRE itself is a thing. Once you hit basic financial freedom and bail on work, if the focus hasn't been about experience, you will experience a massive vacuum. You got the gold ring--and now your goal is gone..... I had that happen to me quite a bit when I first left my super intense job. Ok. Enough. Keep on cranking!